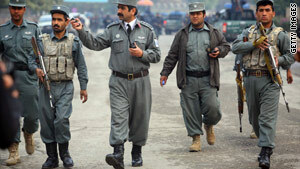 Afghan police rush to the site of a Taliban attack on a hotel in Kabul on Wednesday. United Nations (CNN) -- United Nations Secretary-General Ban Ki-Moon is calling for additional security for U.N. staff in Afghanistan, citing a "dramatically escalated threat" due to the world body's support for that nation's electoral process. Ban's comments came during an emergency meeting of the U.N. Security Council Thursday at the U.N.'s New York headquarters. At that meeting, the Security Council issued a "presidential statement" unanimously condemning an attack by Taliban gunmen in Kabul on Wednesday that killed five U.N. personnel and wounded nine. The Security Council also reiterated its support for the secretary-general and all U.N. personnel in Afghanistan. Ban said the U.N. will "not be deterred" by the attacks, but is considering "consolidating U.N. staff in Kabul and around the country." He also said the U.N. requires "the full protection of the Afghan security forces and the international community," and that his personnel are now considered "soft targets" by militants in Afghanistan. Ban said that Afghan President Hamid Karzai telephoned him Thursday and assured him that the Afghan government will strengthen security assistance for U.N. personnel in Afghanistan. Ban also said the U.N. is "exploring the feasibility of bringing in additional security units to guard U.N. facilities." The U.N. currently has hundreds of staff in Afghanistan offering technical and operational support for Afghanistan's elections. Various other U.N. agencies are involved in humanitarian work in the war-torn nation.